Thank you to Beckett, Wi-Serina, Panther, Charm Boy, Missy and many more (plus their owners and friends) for being part of my 2013. What a great year! I hope all of you and your families have a wonderful 2014! Be safe! The Rapitorial Bracelet includes an engraved nameplate. Add you horse’s name, barn name or date of birth to this nameplate. Both the front and the back can be engraved. 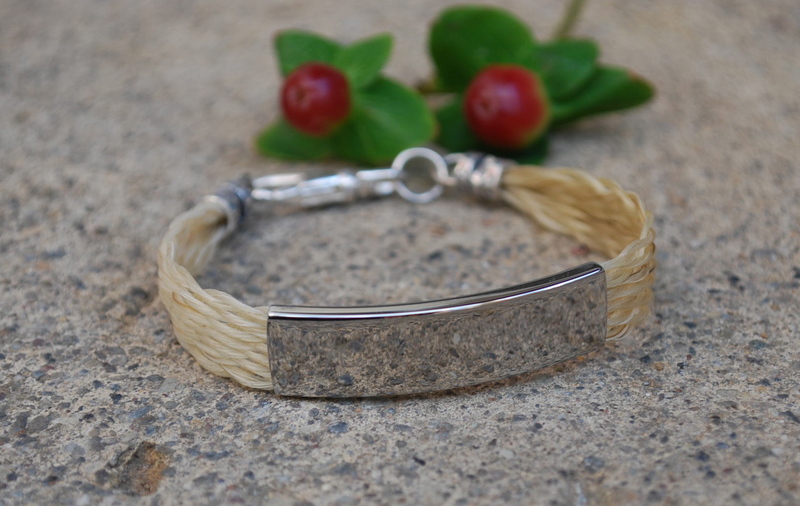 Horse hair jewelry orders that need to be completed and delivered by Christmas, must be to me by December 10, 2013. The horse hair needs to be in my hands with an order form on or (preferably) before December 10 so I can start on your jewelry. Orders received December 11 – December 17 that are needed for December 25 gift giving will include a $30 per item rush fee. All horse hair must be in my mailbox by December 17 for Christmas delivery. Any orders and horse hair received after December 17 will be delivered after Christmas. You can send a check along with your order form and horse hair, or I can invoice you when I receive the order so you can pay with PayPal or a credit card over the internet. Keep in mind that if you don’t know which jewelry piece to pick, you can always give a gift certificate. If you have any questions, please feel free to email me or call me at 610-905-8399. Remember as a kid the fun and excitement of going to a friend’s house and playing with all their cool toys that you don’t have? That was my weekend. The toys: paint, canvas, rubbing alcohol, Liquitex sealer, stamps, putty knives, basting brushes, sand paper, paper towels, tissue paper….the list goes on. Truth be told, I didn’t know Christine until this weekend. My friend Jessica and I took the Experimental Media Painting class in Lancaster and Christine introduced us to color theory, painting techniques, aspects of focal points all in a few short hours. I am not a painter. Nor do I intend to be. I signed up for the class hoping to jump start my creativity by experiencing a type of art with which I am unfamiliar. We painted. We scraped and sanded. We Mod Podged, we spritzed with rubbing alcohol and sprayed with water. We colored with oil pastels and chalk pastels. We painted some more. We cut and glued paper and stuck anything and everything to our canvases. I added horse hair (of course) and deer antler pieces. There were angst-y moments of worrying we’d “ruin” our work and also the realization we can always paint over it and start anew. 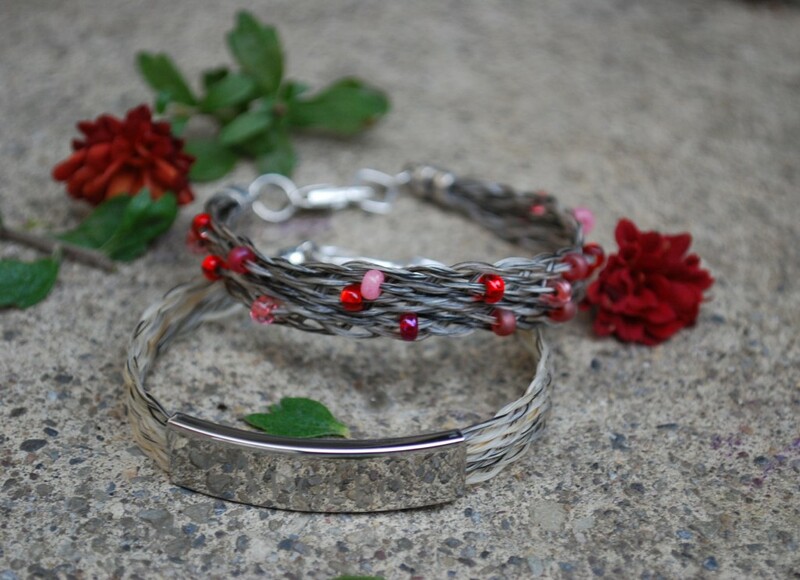 The top bracelet is a Garden Gala Style bracelet with rectangular sterling silver clasp and pink/red bead mix ($83). The bottom bracelet is the Rapitorial style bracelet, which features an engraved nameplate and sterling silver lobster clasp ($95). Well, we survived Hurricane Sandy! That was the worst storm I’ve seen in my many years here in Pennsylvania. Unbelievable, there are still homes in the East without power and many people have lost their homes, cars and other possessions. If you’d like to help these folks donate, contact the American Red Cross. A week of kids home from school, no power and bailing out the basement, and I lost complete track of time. Did you know it’s November already? That means it’s time to secretly harvest some hair from your friends’ horses and send it me so you can wow them this holiday season with some custom horse hair jewelry. It’s really a showstopping gift that’s perfect for any horse lover. Regular deadline for horse hair to be to me is December 1, 2012. It needs to be in my hands with an order form on December 1 so I can start on your order. Orders received December 2 – December 11 that are needed by December 25 will include a $30 per item rush fee. All horse hair must be in my mailbox by December 11 for Christmas delivery. Don’t forget to include the order form! If you have any questions, please feel free to email me or call me. 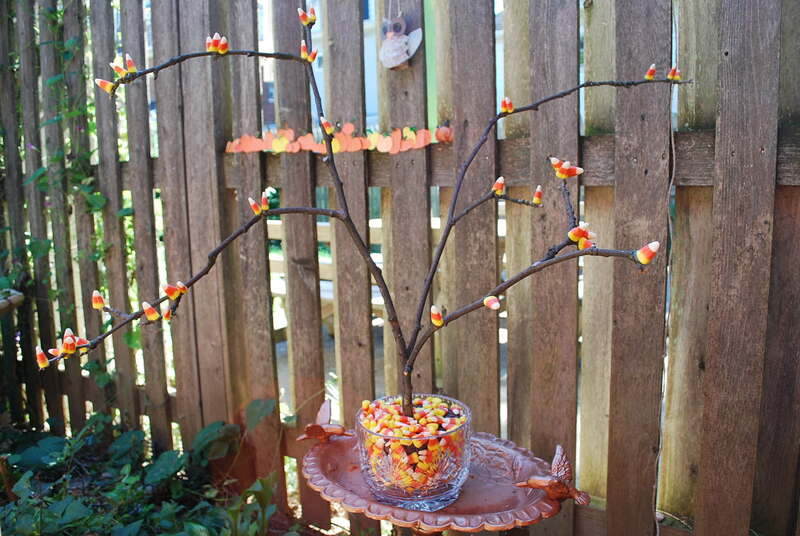 Who knew candy corn grew on trees? Over the years, I’ve made some pretty amazing things with my own two hands. And yet, I think the object that has most impressed my family by far is this Candy Corn Tree I whipped up during our DIY segment of Sticks and Stones #13. With a glue stick, $3 (candy corn was on sale!) and about 8 minutes, I was able to create something that my family thinks is crafting genius. And I can’t even take credit. I saw a similar picture online and re-created it with my own spin. A word of warning: if the environment gets really humid, the candy corn melts off the branch. But you can always glue more on to it. I’m not sure what to take away from this lesson. That it doesn’t take much to create something spectacular? That I already knew. That maybe I shouldn’t try so hard? …..maybe. Or that candy, especially candy corn, always wins. Whatever the lesson, check out how this bit of fall fun was made at Sticks and Stones podcast through our website or on iTunes. Happy Halloween! A little food coloring yields a brand new lunchbox. By now you probably heard that I’ve been working on the video podcast Sticks and Stones with my friend Julia of Wee Sheep Knits. We share our creativity with the world by giving insight into projects we’re working on and providing a DIY segment for the folks at home to try. In Episode 9, Julia taught us how to dye wool yarn using food coloring. It was right up my alley. (Truth be told: we may have burned out my microwave setting the dye, but it was still a blast.) It’s one of those projects that leaves you hunting around for other objects you can dye. And find something I did: my kid’s lunchbox. 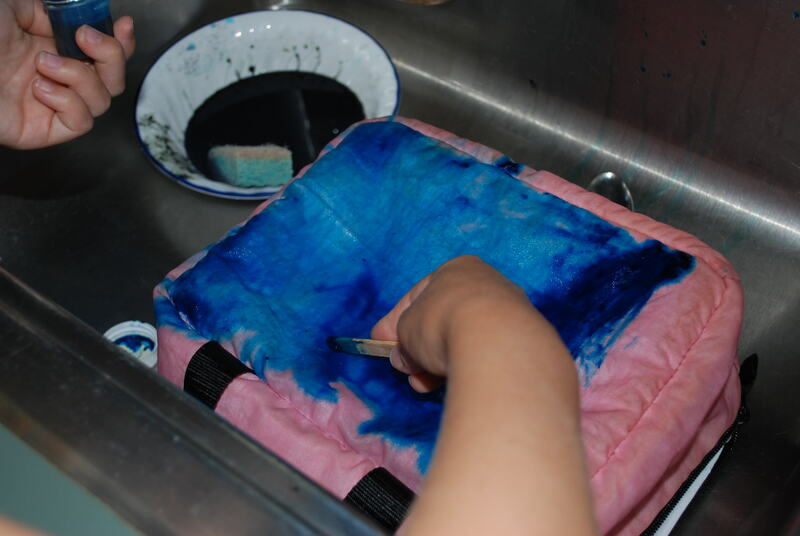 I decided to give dyeing whirl beyond the yarn when my daughter and I dyed her lunchbox. The original light pink lunchbox that’s about to get a makeover. 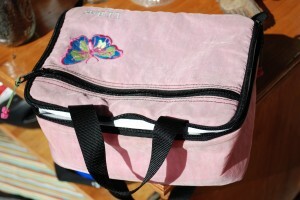 The lunchbox began life as a pink LL Bean nylon lunchbox. My daughter got it when she was in Kindergarten and after 4 years of use it shows no signs of giving up (go LL Bean!). The problem is that my now 4th grader is not the pink princess she used to be. We decide to pour on the food coloring and see if we could give it a makeover. I’m happy to report that it was a success! Here’s how we did it. Preparing your supplies: Boil the water and have it waiting in the wings for Step 3. Rinse the lunchbox so the nylon is completely saturated. Dyeing the nylon: Wearing rubber gloves (so you don’t dye your hands), use a Popsicle stick to spread the icing dye across the nylon of the lunchbox. We did this procedure in our kitchen sink to keep the dye contained so it wouldn’t color unsuspecting bystanders like the kitchen counters. We found that rubbing the dye on directly gave a brighter color. You can also dilute the color in water. Sticks and Stones Episode 9 gives more insight into this process. My artist painting food coloring on her lunchbox. Setting the dye:Pour boiling water and vinegar in a 1:1 ratio into the heatproof container and then place the lunch box in the container as well. I used an aluminum cake pan, adding vinegar until the pan was about 1/4 full and then adding hot water until it was 1/2 full. I poured warm water inside the lunch box so it would remain submerged. Put the lid on the cake pan and wrapped the whole thing in a towel so it stays hot longer. Once this mixture cools, I emptied the cake pan and add a new batch of hot water and vinegar to the cake pan and flipped the lunch box over to submerge the lid, as the whole lunchbox didn’t fit in the pan. Again I lidded the cake pan and wrapped it in a towel. Rinse cycle: Once you’ve set the dye with hot water and the water has cooled, it’s time to rinse out the excess dye with running water. Hang the lunchbox on the washline so it dries completely. Laundering: Finally, I washed the lunch box in the washing machine with regular detergent to make sure all the excess dye came out. I let my daughter apply the colors to the lunchbox. 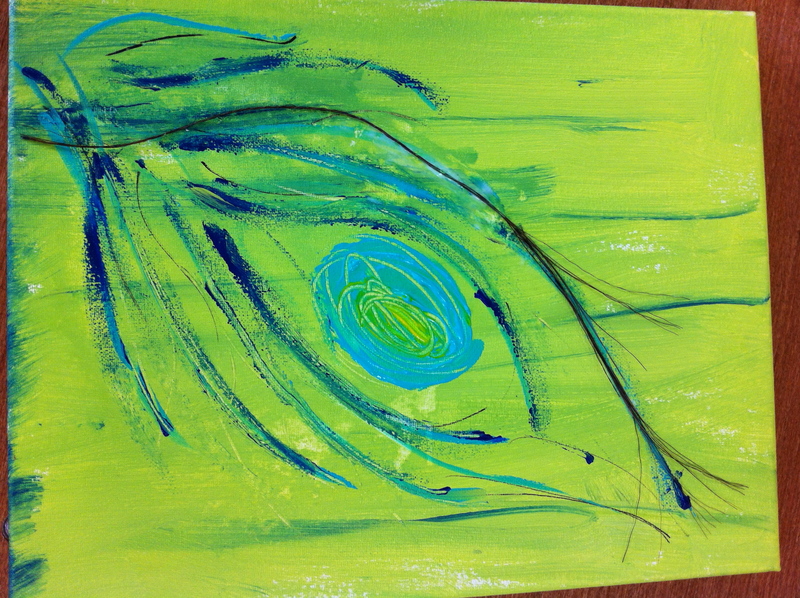 She chose sky blue and leaf green Wilton icing colors. 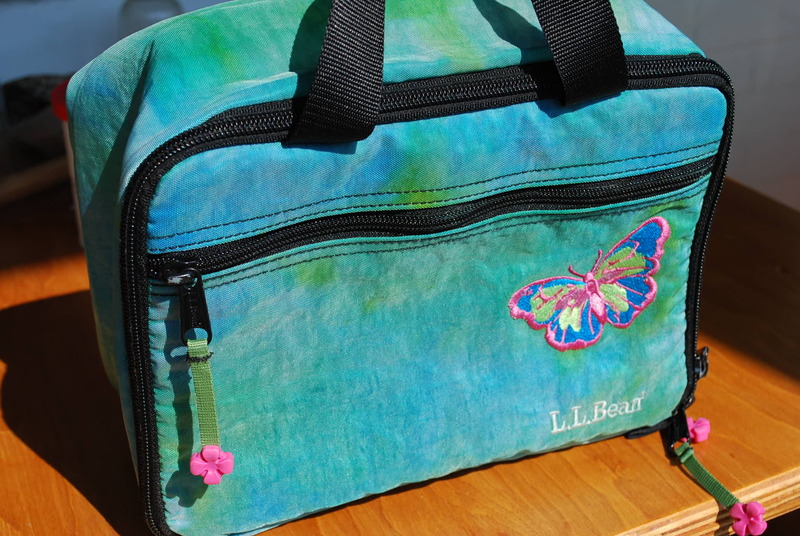 The butterfly patch did not dye at all, but the nylon lunch box did. And laundering the lunchbox removed the bits of dye that got inside the lunchbox. So now I have a happy kid and a few more years before I have to buy new school supplies. 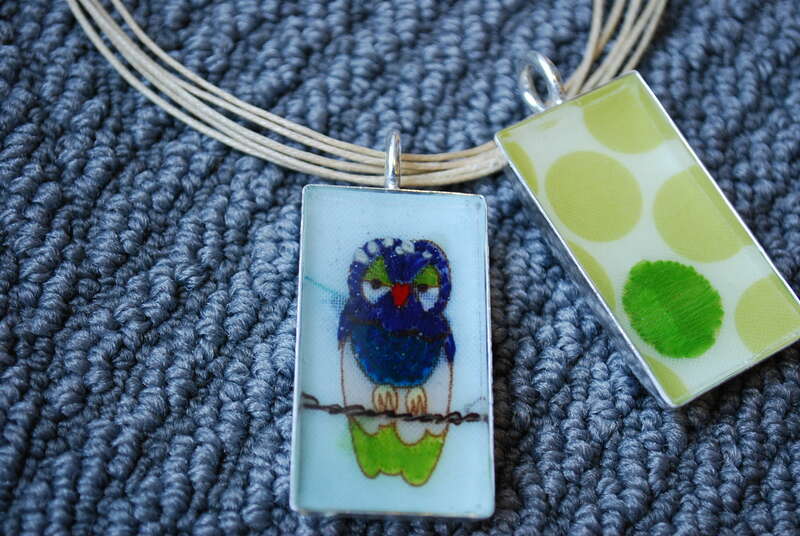 An Alexander Henry owl and Amy Butler dots preserved beneath resin become stylish necklace pendants. My sister-in-law loves fabric, so when I saw a post on Craft about how to use fabric and embroidery in jewelry, I knew I’d found the right birthday gift for her. Lisa Pavelka Magic-Glos really is magic when it comes to quickly making a pendant or earrings. Instead of using a frame pendant used in the Craft post, I used a double-sided pendant from Hobby Lobby and two single pendant frames from Rio Grande. 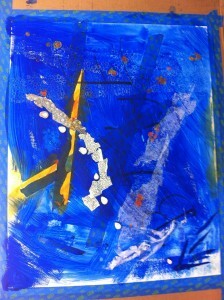 Then I employed Lisa Pavelka’s Magic-Glos UV Resin. This stuff is so easy to use and it cures in the sun in 5 minutes! Who could ask for more (except for maybe a sunny day). I found fabric my sis-in-law loves, in this case Alexander Henry’s Spotted Owls and a classic dot pattern from Amy Butler. Then I embroidered parts of the design with sewing thread and embroidery floss. After experimenting a bit, I found it’s better to embroider a few areas of the design rather than all of it. 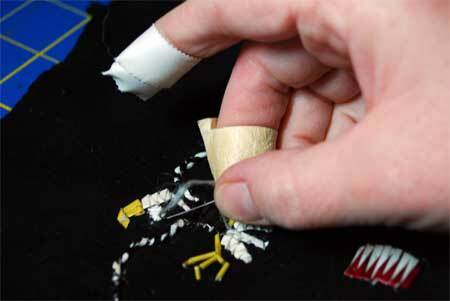 The resin mutes the texture of the stitching, but the stitching brightens the pattern a bit. It’s also a good idea to cut a template the size of the inside of the pendant, so you can move it across your fabric to decide which part of the design you want to use. Iron fusible interfacing to the back of the fabric and then cut the design to the size of the pendant. Use the template you created to cut out the design. 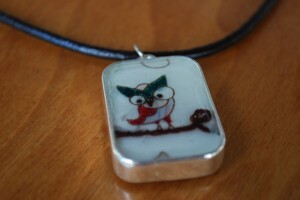 Place the design inside the pendant. Use Magic-Glos to finish the pendant. Several thin layers of Magic-Glos work better than one thick layer. Cure each layer in the sun before applying the next layer. Truth be told, I messed up the pendant I showed on Sticks & Stones so I had to make another pendant for my sis-in-law’s birthday. I ended up making her two pendants so she can choose which one she wants to slip onto the necklace. Magic-Glos covers photos, metal, found objects, just about anything you would want to collage onto a pendant. 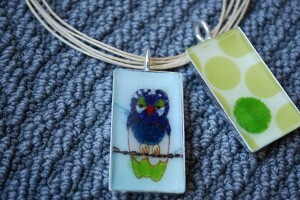 You can also use it for inclusions, such as sprinkling in glitter between the layers of resin. This maybe be my new go-to birthday present for friends and family. Channel 69 Reporter Melanie Falcon shows off the horse hair bracelet she made with me on live TV this week. As a journalism major, I dabbled in all areas of media to see what worked for me. One semester of Havenscope, our university TV show, made me realize broadcast journalism wasn’t for me. This week, I finally got to put to work those few skills I learned from Havenscope when I appeared on Channel 69’s Sunrise news show talking about my horse hair jewelry. I had a great time with reporter Melanie Falcon, as we did three live segments in which we demonstrate the steps to creating a singular piece of jewelry. If you didn’t get to see the program you can check it out here. 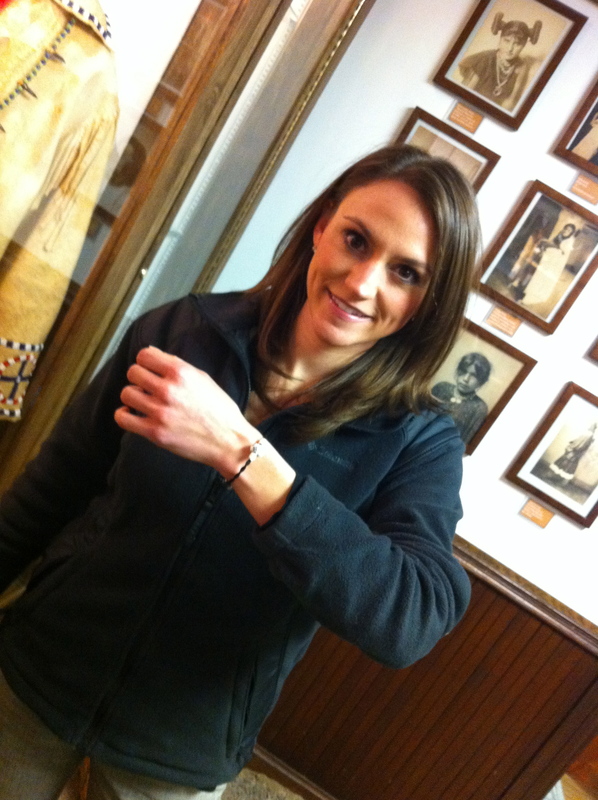 Melanie was a whiz creating jewelry on the fly and she headed out of our TV segment with a horse hair bracelet with beads. I’m teaching that class this weekend, February 4, at the Museum of Indian Culture. Melanie and I had a fun time working together and the live TV aspect wasn’t as stressful as I imagined it would be. Response due to the television exposure was so great that I scheduled a second horse hair jewelry class for tomorrow afternoon. The power of television is immense! I can’t believe how many folks saw the segments. 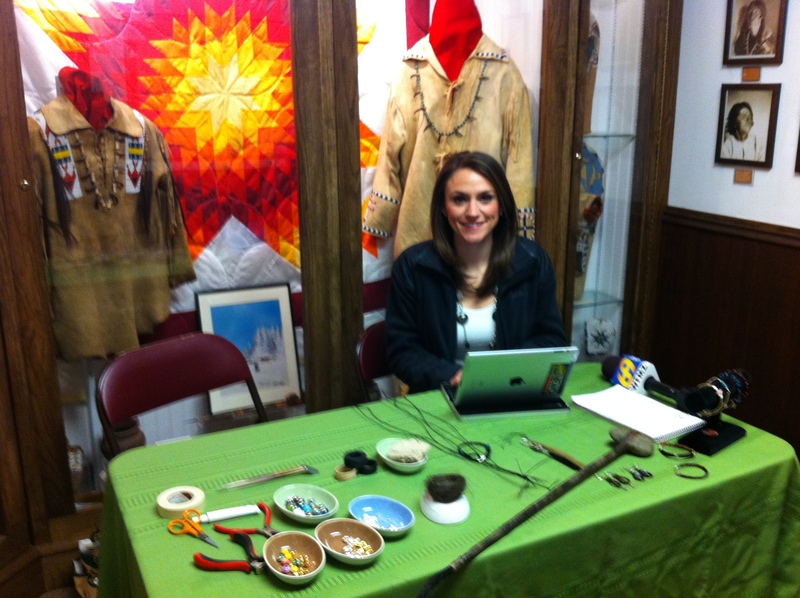 Hanging out at the Museum of Indian Culture with Melanie Falcon between TV segments. The war shirt in the background has horse hair locks hanging off the sleeves. We’ll likely run the class again in April, so if you didn’t get to make it this time, you’ll have another chance. Email me to put you on the waiting list and I’ll let you know when the next class will run. My kids got a kick out of watching me on TV. When I got home my son wanted to know if I was going to do this job every week. Sorry, buddy, my TV career isn’t happening anytime soon. I’m happy with my 15 minutes and leaving the rest to Melanie. This week I just sent out these beauties. Garden Gala Bracelet with blue bead mix and lobster clasp. This Garden Gala bracelet with blue beads is heading across the country to a customer in California. I love to mix different shades of the same color. And blue pops on any color horse hair. 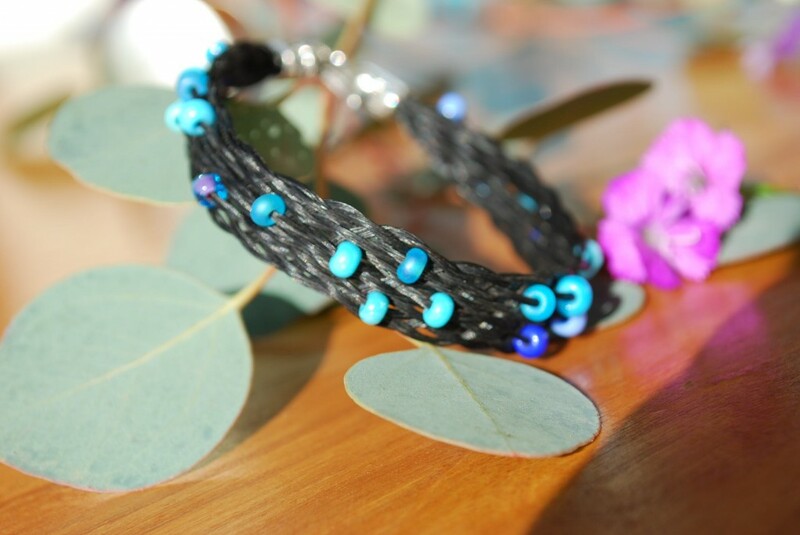 You can get a bracelet like this made with any color beads. Staying on this side of the country, this Garden Gala bracelet is heading right over the border to New Jersey to a returning customer. 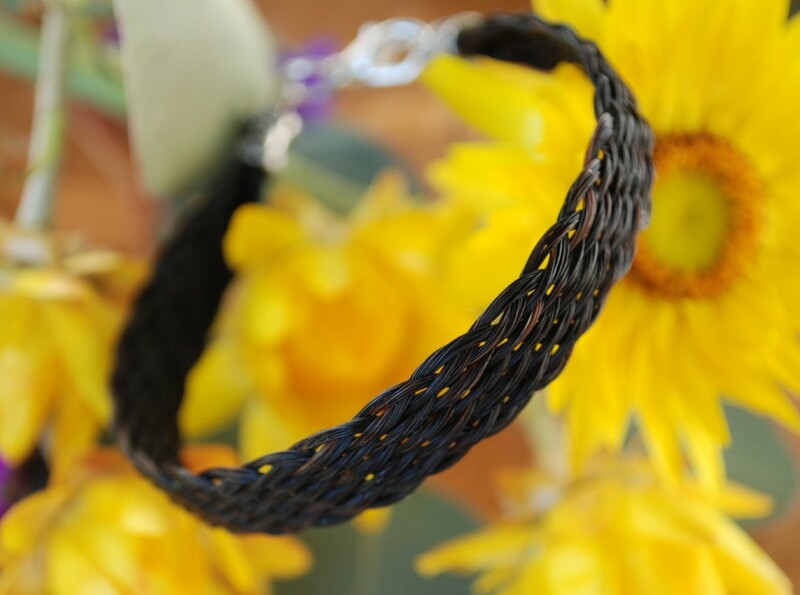 The classic look of a Garden Gala-style bracelet looks great on men or women. You can order either of these styles from this site. Also new, you can follow me on Facebook and Twitter! Find out what I’m working on and new products and classes coming your way. 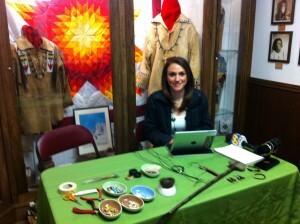 Join me this weekend for a Porcupine Quillwork Class at the Museum of Indian Culture. Sunday, January 15, 2012, I will offer Quillwork Part 1 from 10 am to noon and Quillwork Part 2 from 1 pm to 3 pm. Signup is required so contact the Museum or me by Friday, January 13. Snowdate for the class is Sunday, January 29. More information..